Hydraulic Repair Company | Hydraulic Service & Repair | Champion Hydraulics | Brownsburg, Indiana | Champion Hydraulics, Inc. Owner Dan Powers got his start in the hydraulics industry working on hydraulic aviation equipment for the U.S. Navy. Then, after spending several years working for other hydraulic service companies in northern and central Indiana, he decided to launch his own company in 2001 with a commitment to quality service — the driving force behind Champion Hydraulics today. Joe is an Indiana native and graduate of Brownsburg High School, who secured a degree in Diesel Technology from Vincennes University. He now works as a Service Technician for the Champion Hydraulics team. Kirsten supports company operations by maintaining office systems and procedures. She also lends a hand where needed in the shop and helps maintain the company website. Champion Hydraulic comes with decades of experience. Founded in 2001 in central Indiana, Champion is a complete provider of parts and service for the industrial and commercial hydraulics industry. 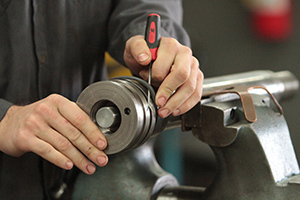 We offer comprehensive maintenance and repair of hydraulic equipment and machinery across a wide range of industries, plus component sales of hydraulic cylinders, motors, pumps, hoses, power units, and more. No job is too big or too small for Champion Hydraulics. We provide the same responsive service and fast turnaround for all our customers. So whether you need us to troubleshoot your problem, maintain your hydraulic machines, repair your equipment in our shop or on your site, or design a system that works for your particular business, we can help. The company services its customers from its Brownsburg, Indiana hydraulic service center. Service areas include the state of Indiana (including Indianapolis, Crawfordsville, Lafayette, Fort Wayne), as well as parts of Illinois and Kentucky.